Of German stock dating back to 1530 in Saxony, Eric George Ackermann GM was born on the Isle of Wight in 1919 and became a leading figure in the world of signals and electronic intelligence. 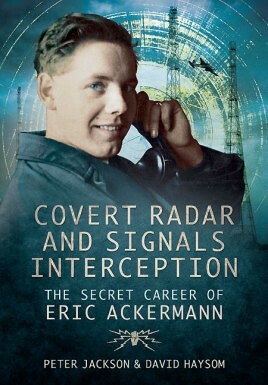 As a Junior Scientific Officer at the Telecommunication Research Establishment, Boscombe Down, with an honorary commission in the Royal Air Force, he made numerous flights over occupied territory searching for, monitoring and destroying Germany's Wuerzburg, Knickebein and X Band radar systems. Much of his research was passed to the highest levels of wartime government, and was highly prized, ensuring that tactical plans could be executed that took full advantage of known, top secret German intelligence. A host of secret missions to assess the enemy's radar capabilities were carried out in North Africa, Gibraltar and Italy. This new and engaging biography explores the various highs and lows of his operational deployment at the vanguard of tactical intelligence operations in these exciting theaters of war. Winner of the George Medal for conspicuous gallantry, his efforts weren't confined to the offices of war. He saw conflict up close and personal, and was therefore aware of the urgency of his endeavours, and the extent to which his findings made a difference. The end of the war was a cause of great celebration, but it did not signal the end of Ackermann's role, far from it. He was to play a major part in the setting up and implementation of a string of listening stations built along the borders of Soviet Bloc countries which were destined to glean a wealth of invaluable post-war intelligence. Further work in aeronautics and satellite construction in the States followed, meaning the reach of Ackermann's influence could be allowed to stretch yet further.rnrnYet despite the might and scale of his achievement, he has never before been the subject of a book-length study. The authors, Peter Jackson and David Haysom, have made every effort to rectify that in this new publication which is sure to appeal to aviation enthusiasts, as well as the more general reader curious to gain new insights into twentieth century intelligence practices and their often far-reaching consequences.